For the Accounting Industry, integration has been completed to provide Practice Engine customers in-app use of QuickFee functionality. This integration provides a significant time savings for our team and enhances our clients’ experience with the firm. 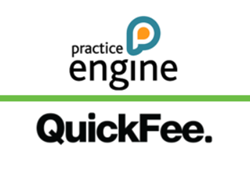 Integration has been completed to provide Practice Engine customers in-app use of QuickFee functionality. Practice Engine is a practice management solution for professional service firms, providing key features such as paperless billing, expense tracking, job and workflow management, and more. QuickFee provides accounting and other professional service firms with an online payment portal, which is customized to the firm and contains a unique financing option. QuickFee’s portal is the only gateway on the market for CPAs and law firms that allows payments by not only credit card and ACH, but also QuickFee’s proprietary Fee Financing option. With Fee Financing, a firm’s clients can borrow the funds to pay their outstanding balance, and in turn they pay back QuickFee over 3 to 12 months while the firm is immediately paid in full. Practice Engine excels at making the management of accounting firms stress free, and the integration of an industry-leading payment portal is another step further in that direction. “With Practice Engine becoming one of the preeminent practice management solutions for medium to large accounting firms, we’re very excited about this integration” said Bruce Coombes, CEO of QuickFee. Practice Engine has the enviable reputation of being the only true thin practice management solution. Its browser-based user experience allows the system to run on any device that supports a modern browser. This makes it mobile as standard. QuickFee provides accounting, law, and other professional service firms with an industry-leading payment portal that integrates Fee Financing into their billing process. QuickFee’s innovative payment portal is a 2017 Accounting Today ‘Top New Product’. Portal and fee financing details at http://web.quickfee.com/portal/?utm_source=akh. ©2017 QuickFee, Inc. & Practice Engine Systems, Inc.